Firework safety is paramount! Below are 10 simple points to remember so that you and your guests have an enjoyable fireworks display experience. Fireworks can only be sold and supplied to persons over the age of 18 years old. This includes sparklers as they are classed as fireworks so the same laws apply. 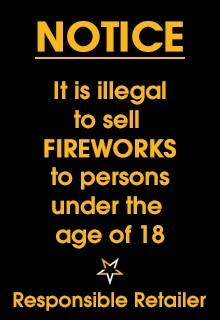 It is also illegal for anyone under the age of 18 to be in possession of fireworks in a public place. It is not a legal requirement to have any kind of licence or training to buy consumer fireworks. Category 4 (Professional) fireworks are strictly for the use of a fully qualified professional fireworks company with all year insurance and licensed storage. All consumer fireworks should conform to British Standards (BS 7114) and be classified as Category 2 (Garden) or Category 3 (Display) fireworks, or conform to the EU equivalent, or carry a CE mark. There is a legal noise limit of 120db on all consumer fireworks. Certain items are banned in the UK. These include bangers, air bombs and jumping jacks.